(Protected) Music: streaming to five computers every 24 hours, unlimited CDs (seven with an unchanged playlist), unlimited iPods and iPhones. Yes (for purchased movies and TV shows). Streaming for music via Apple Music. Steve Jobs saw the opportunity to open a digital marketplace for music due to the rising popularity of easily downloadable tracks. In 2002, Jobs made an agreement with the five major record labels to offer their content through iTunes. iTunes Store was introduced by Jobs at the company's Worldwide Developers Conference in April 2003. It was initially available on Mac computers and the iPod, and was later expanded to Microsoft Windows in October 2003. In April 2008, the iTunes Store was the largest music vendor in the United States, and in February 2010, it was the largest music vendor in the world. iTunes Store's revenues in the first quarter of 2011 totaled nearly US$1.4 billion. By May 28, 2014, the store had sold 35 billion songs worldwide. In 2016, it was reported that music streaming services had overtaken digital downloads in sales. It was reported that iTunes-style digital download sales had dropped 24% as streaming sales continued to increase. In April 2018, the iTunes app was added to the Microsoft Windows 10 app store.Beginning in the spring of 2019, the iTunes app became available on Samsung Smart TVs. Following the introduction of iTunes Store, individual songs were all sold for the same price, though Apple introduced multiple prices in 2007. Music in the store is in the Advanced Audio Coding (AAC) format, which is the MPEG-4-specified successor to MP3. Originally, songs were only available with DRM and were encoded at 128 kbit/s. At the January 2009 Macworld Expo, Apple announced that all iTunes music would be made available without DRM, and encoded at the higher-quality rate of 256 kbit/s. Previously, this model, known as "iTunes Plus", had been available only for music from EMI and some independent labels. Users can sample songs by listening to previews, ninety seconds in length, or thirty seconds for short tracks. In addition, iTunes Store offers apps, which are applications used for various purposes (games, productivity, news, etc.) that are compatible with the iPod Touch, iPhone, and iPad, although some apps are specifically for the iPhone or iPad only. Some Apps cost money (called "Paid Apps") and some are free (called "Free Apps"). Developers can decide which prices they want to charge for apps, from a pre-set list of pricing tiers, from free to several hundred dollars. When someone downloads an App, 70 percent of the purchase goes to the developer(s), and 30 percent goes to Apple. At the Macworld 2008 keynote, Steve Jobs, who was Apple's CEO at the time, announced iTunes movie rentals. Movies are available for rent in iTunes Store on the same day they are released on DVD, though iTunes Store also offers for rental some movies that are still in theaters. Movie rentals are only viewable for 24 hours (in the US) or 48 hours (in other countries) after users begin viewing them. iTunes Store also offers one low-priced movie rental a week: in the United States, this rental costs 99 cents. Movie rentals are not yet available in all countries but it is available in the United States, Mexico, the United Kingdom, Canada, Australia and New Zealand. There is a weekly promotion in which one to three songs are available to download for free to logged-in users. Free downloads are available on Tuesdays, and remain free until the following Tuesday, when the store gets refreshed with new content. Some artists choose to have select songs available for no charge. This is not available at all iTunes Stores. Some iTunes television programs have begun the same technique to encourage brand loyalty; although those stay longer. In fact, iTunes Store has a "Free TV Episodes" page where free episodes are organized by length, either as "featurettes" (shorter than 15 minutes) or full length episodes (longer than 15 minutes). Free content can vary from a preview of a show to bonus content to pilot episodes and entire seasons of TV shows (examples of free seasons include HBO's The Weight of the Nation and ABC's Pan-Am). Some networks, such as ABC and NBC, have their own pages of "Free Season Premieres". While previously the US iTunes Store has offered as many as three free songs each week (the single of the week, Discovery Download, and Canción de la Semana) in recent years, the store has instead replaced the three aforementioned categories with a unified "Single of the Week" banner, with the week's single being from a new up and coming artist. In 2015, Apple discontinued the "Single of the Week" program. A song usually costs 99¢; however, for songs with high popularity, the price is usually raised to $1.29. By default, songs that are more than 10 minutes are considered "Album Only"; distributors also have the power to make a song "Album Only." For special offers, song prices can be dropped to 69¢ or free. By default, music albums cost $9.99 or the price of all the songs combined if it is less than $9.99. However, the music album's distributor can set a higher price for the album (as long as it is some amount of dollars and 99 cents), which usually happens on popular music albums. For special offers, prices of music albums can be dropped to $5.99, $6.99, or $7.99. On June 30, 2015 Apple launched Apple Music as a subscription service, initially available in 110 countries. New subscribers are offered a three-month free trial with ongoing subscriptions priced from $9.99/month in the US and £9.99 in the UK. By default, HD television episodes cost $2.99, while standard definition television episodes cost $1.99. However, distributors can make a television episode "Season Only." A television season costs either an amount of dollars (determined by number of episodes and definition) and 99 cents with the number in the one's place being a 4, 7, or 9, or the price of all episodes combined. Unpopular movies cost $7.99 to buy in standard definition and $13.99 or $14.99 to buy in HD. Popular movies or new releases cost $13.99 or $14.99 to buy in standard definition and $17.99 or $19.99 to buy in HD. Unpopular movies cost $2.99 to rent in standard definition and $3.99 to rent in HD. Popular movies cost $3.99 to rent in standard definition and $4.99 to rent in HD. For recent releases, this price is increased by $1. Movies that are available in 4K and HDR (either HDR10 or Dolby Vision with an HDR10 profile) cost the same price as HD, and are automatically upgraded from HD to 4K and HDR at no additional cost. Movies can be played back in 4K and HDR on the Apple TV 4K hooked up to a compatible display, and can be played back in HDR on the iPhone 8, iPhone 8 Plus, iPhone X, 10.5" iPad Pro, and the 2nd gen 12.9" iPad Pro running iOS 11 or later. App prices are set by the developer; they can be free of charge or charged at 99 cents plus any number of dollars. iTunes Store allows users to purchase and download items directly to portable Apple devices, such as the iPhone, iPad, Apple TV and iPod Touch. Apple offers three apps, each of which provides access to certain types of content. The App Store app sells apps for iOS, and also provides updates to these apps. The iTunes Store app sells music and videos. The iBooks app sells ebooks. The Podcasts apps lets users download, subscribe to and sync podcasts. The iTunes U app gives access to iTunes U educational material. Originally, mobile users had to be connected to a Wi-Fi network in order to enter the store, hence its original name: iTunes Wi-Fi Music Store. However, at Macworld 2009, Apple issued a software update which automatically allowed 3G and EDGE users to access the store's full functionality for files smaller than 10 megabytes (MB). The iOS 3.0 update added the ability to download movies, TV shows, audiobooks, iTunes U, and ringtones on mobile devices, in addition to the previously available songs and podcasts. On February 18, 2010, Apple increased the 10 MB 3G download limit to 20 MB. In March 2012, Apple increased the 3G download limit to 50 MB, and, in late 2013, Apple increased the limit to 100 MB when they released the final version of iOS 7 for their new iPhones. In the United States, Apple provides technical support for iTunes Store via email, there is no phone number for issues with iTunes purchases. Most customer service inquiries are handled online, via the Report a Problem link in iTunes. In response to major natural disasters, Apple provides the facility for donations to be made through iTunes Store. Unlike other iTunes purchases, donations made to charitable organisations through this system are not subject to the 30% handling fee Apple usually charges. iTunes donation pages were set up following the 2010 Haiti earthquake, the 2011 Japanese earthquake and ensuing tsunami, and 2012's Hurricane Sandy. In all of these cases, donations were redirected to the Red Cross. The store began operations after Apple signed deals with five major record labels: EMI, Universal, Warner, Sony Music Entertainment, and BMG. Songs from more than 2,000 independent labels were added later, the first being from The Orchard on June 24, 2003. As of 2017, iTunes Store offers more than 43 million songs, including exclusive tracks from numerous artists. Not all artists are available on iTunes, but many holdouts, such as Led Zeppelin and Radiohead, have allowed their music to be sold on iTunes Store in recent years. New songs are added to iTunes catalog on a daily basis, and iTunes Store is updated each Tuesday. Downloaded songs come with song information (name, artist, album) already filled out, though iTunes provides a free service by Gracenote to do this for songs not purchased from the store, although they must be imported with iTunes. Songs that have an entry in iTunes Store also come with album artwork (Artwork is embedded in the metadata). Artwork can be obtained for songs not purchased from the store for free if the user has an iTunes Store account. Purchased songs do not come with lyrics, nor does iTunes provide a service for acquiring the missing lyrics. However, several third-party applications exist to locate and automatically add lyrics to the user's music. Some songs are available from the store by "Album Only", meaning the song can only be acquired through the purchase of the entire album, whereas most songs can be downloaded separately from the album they belong to. Songs above 10 minutes in length are by default Album Only songs. However, this is not universally true; for example, Living in the Heart of the Beast by Henry Cow is 16 minutes and 18 seconds, yet is available for individual purchase as of December 24, 2013. Soundtracks also often have many Album Only tracks. Sometimes, the 10-minute restriction works in an artist's favor. Examples of this include Prince's Lovesexy and the deluxe version of Phoenix's Bankrupt!, which both have an album as a single track instead of being separate, (in Prince's case, the track was the album, while in Phoenix's case, it was a collection of demos and outtakes) forcing the buyer to buy the album itself. Movie soundtracks normally include songs owned by many different labels, making licensing more complex. For example, Forrest Gump: The Soundtrack includes songs from Peacock Records, Argo Records & Capitol Records, among many others. Greatest Hits by Red Hot Chili Peppers has only one song, "Higher Ground", that is not available for download on a per song basis, whilst Circus (Britney Spears' 2008 album) has two songs that are available for album download only, Rock Me In and Phonography. Some albums area available from the store by "Partial Album", meaning that albums cannot be entirely purchased, but that one or more of the tracks that can be purchased on the physical CD version of them aren't included, e.g. possible due to licensing issues. Some tracks are listed as "Work Only", which means they can only be obtained by purchasing the entire piece of work (within the album); the tracks cannot be bought as singles. Works are generally pieces of classical music: symphonies, string quartets, etc., in multiple movements. In September 2009, Apple introduced the iTunes LP format (known pre-launch by the code name "Cocktail") which features visual, interactive content alongside album tracks and lyrics. When entering the US music store, there are multiple sections one can visit. Music is divided into genres (Alternative, Classical, Jazz, Soundtrack, etc. ), and there are a number of links to other sections of the store under the Quick Links header. These include Recommended for You, Complete My Album, iTunes LP, as well as thematic sections, such as iTunes Festival sections. On November 1, 2006, Apple created a category for Latino and Hispanic content, "iTunes Latino". Telemundo and Mun2 made some of their popular programs available for purchase, becoming the first Hispanic television content in the store. It offers music, music videos, audiobooks, podcasts and television shows in Spanish in a single concentrated area. The brief descriptions given to the content are in Spanish as well as several subcategories. Gibraltarian Flamenco Metal band Breed 77, released an exclusive album called Un Encuentro to coincide with the launch of "iTunes Latino". It features 11 songs, all from previous albums, but all sung in Spanish. In 2012, Apple created Mastered for iTunes. When iTunes launched, the decision was made to standardize on AAC instead of the more popular MP3 format on the supposition that it offers better quality compared to other codecs at similar bit rates. Mastered for iTunes (MFiT) is a procedure developed by Apple specifically for Mastering Engineers to follow. This set of tools allows Mastering Engineers to audition Apple's proprietary encoding during the mastering process to take into account how music will eventually interact with Apple's encoding. In addition to auditioning the encoder, there is also a tool (called afclip) that processes the audio file and creates a text file for audio clips. Because of this special encoding process, extra attention must be paid to headroom and inter-sample peaking while mastering. While most downloaded files initially included usage restrictions enforced by FairPlay, Apple's implementation of digital rights management (DRM), iTunes later initiated a shift into selling DRM-free music in most countries, marketed as iTunes Plus. On January 6, 2009, Apple announced that DRM had been removed from 80% of its music catalog in the US. Full iTunes Plus availability was achieved in the US on April 7, 2009, coinciding with the introduction of a three-tiered pricing model; however, television episodes, many books, and films are still FairPlay-protected. There is a policy of censoring profanity in titles on iTunes. This has resulted in a Scunthorpe glitch, by which inoffensive titles are censored due to a coincidental string of letters. If the song has an explicit label, it will be marked "explicit" next to the song title. If a song is marked "explicit" it is unavailable for purchase if "restrict explicit content" is checked under the parental controls preference. Often there will be a "clean" mark next to the title of some songs, meaning the lyrics have been censored, and is available to purchase on all accounts. Generally if a song is marked "clean" there is an explicit version available as well. Since its launch, iTunes Store has crossed many milestones. In the first 18 hours, the store sold about 275,000 tracks, and more than 1 million tracks were sold in its first 5 days. When released for Windows in October 2003, iTunes was downloaded more than 1 million times in the first 3 days, selling more than 1 million songs in that period. On December 15, 2003, Apple announced that it had sold 25 million songs. In January 2004 at the Macworld Conference & Expo in San Francisco, Steve Jobs announced (Sellers, 2004) that an unnamed person had purchased US$29,500 worth of music. On March 15, 2004, Apple announced that iTunes Music Store customers had purchased and downloaded 50 million songs from iTunes Music Store. A song sold on iTunes gives the artist 9 cents in profit. They also reported that customers were purchasing 2.5 million songs a week which translates to a projected annual run rate of 130 million songs a year. The 50 millionth song was "The Path of Thorns" by Sarah McLachlan. On April 28, 2004, iTunes Music Store marked its first anniversary with 70 million songs sold, clear dominance in the paid online music market and a slight profit. The store also offers hundreds of movie trailers and music videos, in an attempt to boost soundtrack sales. In the conference, Steve Jobs reiterated that a subscription service is still not in the interest of customers and reported that only 5 million of the 100 million songs offered in the Pepsi giveaway campaign were redeemed, which he blamed on technical problems in Pepsi distribution. According to an Apple press release dated August 10, 2004, iTunes Music Store was the first store to have a catalog of more than one million songs. Also, iTunes Music Store at that point maintained a 70 percent market share of legal music downloads. The emerging monopoly of the store has been criticized by Mike Lang of Miramax for "effectively strangling the industry". He says that because the music industry has allowed too few content providers, it is now suffering. Lang views the issue as being more of a threat than music piracy. On July 5, 2005, Apple announced a promotion counting down to half a billion songs sold. On September 12, 2006, Steve Jobs announced in his "It's Showtime" keynote that Apple had 88% of the legal US music download market. On April 11, 2007, Apple announced that iTunes Store had sold more than two million movies, making it the world's most popular online movie store. On February 26, 2008, iTunes Store surpassed Best Buy to become the second-largest music vendor in the US behind Walmart, and became number one on April 3, 2008. On October 10, 2012, iTunes Store was reported to have a 64% share of the online music market, and a 29% share of all music sales worldwide. The countries where iTunes Store is available are shown in green. To buy files through the store, a user must install the proprietary digital media player iTunes to access the store. This software is available only for certain versions of the Macintosh or Windows operating systems. According to an Apple press release, the European iTunes Music Stores sold a combined total of 800,000 songs in one week, with 450,000 of those songs sold in the UK. The Italian, Portuguese, Dutch, Greek stores have been localized. On December 3, 2004 the British Office of Fair Trading referred iTunes Music Store to the European Commission because it prevents consumers in one EU country from buying music from stores in other EU countries, in violation of EU free-trade legislation; the immediate cause of the referral was because the €0.99 price charged in the Eurozone equates to UK£0.68 in sterling, rather than the UK£0.79 actually charged there. iTunes Music Store in Japan had 1 million songs available at start. In the next four days the store had sold one million songs – the pace faster than that of the US store. In addition to a long delay, Apple failed to have one set price for singles. Pundits[who?] speculated that this may have indicated the introduction of new price structure to the rest of the stores in future, in favor of record labels[who?] who would like to see higher prices for new songs. This extension to other countries was announced in January 2009. The release of video-capable iPods also saw the store launch in Australia with music videos and short films by Pixar. iTunes Gift Cards (as they are now known) are now also available in many more stores such as JB Hi-Fi, David Jones, and the Woolworths chain of stores. Access was inadvertently given to some people in New Zealand, too. Failed negotiations with the Sony BMG label meant that none of that label's artists were available at the time of launch; they were later added on January 17, 2006. New Zealand users had briefly been able to buy from the Australian store when it first opened until that loophole was closed. On November 1, 2006, the store started offering a range of Latino content including television shows and music for its Hispanic American, Mexican and Puerto Rican clients. The Spanish used on the Mexican store has been modified to Mexican Spanish. As of the 2009 Macworld Conference & Expo, Apple had given no new information of the (possible; future) inclusion and expansion of music videos, TV-shows and movies in other European countries. The stores of the UK, Germany and France currently remain the only European Stores with local and/or localized selections of TV-shows, movies and music videos. A user must also pay with an iTunes gift card or a credit card with a billing address in Australia, Austria, Belgium, Brunei, Bulgaria, Brazil, Cambodia, Canada, Colombia, the Czech Republic, Cyprus, Denmark, Estonia, Finland, France, Germany, Greece, Hong Kong, Hungary, India, Indonesia, the Republic of Ireland, Italy, Japan, Laos, Latvia, Lithuania, Luxembourg, Macau, Malaysia, Malta, Mexico, the Netherlands, New Zealand, Norway, Philippines, Poland, Portugal, Puerto Rico, Romania, Russia, Singapore, Slovakia, Slovenia, Spain, Sri Lanka, Sweden, Switzerland, Taiwan, Thailand, Turkey, United Kingdom, the United States or Vietnam. Apple also offers other payment methods (like PayPal), which differ from country to country. Residents in other countries can only buy a gift card from a merchant or download free podcasts and previews. iTunes Store uses Apple's FairPlay digital rights management (DRM) technology. FairPlay is built into the MP4 multimedia file format as an encrypted AAC audio layer, and is used by the company to protect copyrighted works sold through the store, allowing only authorized devices to play the content. The restrictions imposed by FairPlay, mainly limited device compatibility, have sparked criticism, with a lawsuit alleging antitrust violation that was eventually closed in Apple's favor, and various successful efforts to remove the DRM protection from files, with Apple continually updating its software to counteract such projects. In February 2007, an open letter by Steve Jobs, Apple's then-CEO, discussed the use of DRM on music, raising points about the future of the protection and announcing the company's support for ending the use of DRM. Although the open letter initially caused mixed industry reactions, Apple signed a deal with a major record label the following month to offer iTunes customers a purchase option for a higher-quality, DRM-free version of the label's tracks. In January 2009, Apple signed deals with all major record labels as well as a large number of independent labels to offer all iTunes music in the DRM-free option. This does not apply to songs downloaded while using Apple Music, Apple's subscription-based music streaming service. On Super Bowl Sunday, February 1, 2004, Apple launched a promotion with Pepsi in which they gave away 100 million songs, through tokens on selected soft drink bottle caps. Unfortunately for Apple, Pepsi failed to properly distribute the bottles to major metropolitan areas until only weeks before the promotion ended, despite a one-month extension of the deadline by Apple. The promotion was repeated beginning January 31, 2005, with 200 million songs available, and an iPod Mini given away every hour. On July 1, 2004, Apple announced that, starting with the sale of the 95 millionth song, an iPod would be given away to the buyer of each 100 thousandth song, for a total of 50 iPods. The buyer of the 100 millionth song would receive a PowerBook, iPod, and US$10,000 gift certificate to iTunes Music Store. Ten days later, on July 11, Apple announced that 100 million songs had been sold through iTunes Music Store. The 100 millionth song was titled "Somersault (Dangermouse Remix)" by Zero 7, purchased by Kevin Britten of Hays, Kansas. He then received a phone call from Apple CEO Steve Jobs, who offered his congratulations, as well as a 40 GB 3rd Generation iPod laser-engraved with a message of thanks. Inspired by Pepsi's marketing success with iTunes giveaways, Coca-Cola partnered with 7-Eleven to give away a free iTunes song with every 32 US fl oz (950 ml). Slurpee frozen beverage until July 31, 2005. Songs could be redeemed until August 31, 2005 by entering a code printed on the Slurpee cup into iTunes Music Store application. Coca-Cola did this in spite of having its own music store, myCokeMusic.com, that competed with iTunes Music Store in Europe. myCokeMusic.com ceased business on July 31, 2006. On July 5, 2005, Apple announced that they were counting down to half a billion songs. The buyer of every 100 thousandth song up to 500 million would receive an iPod Mini and a 50-song gift card. The grand prize for the person who downloads the 500 millionth song was 10 iPods of their choice, a 10,000-song gift card, 10 50-song gift cards or 4 tickets to the Coldplay world tour. Twelve days later, on July 17, Apple announced that 500 million songs had been sold through iTunes Music Store. The 500 millionth song, purchased by Amy Greer of Lafayette, Indiana, was "Mississippi Girl" by Faith Hill. On July 28, 2005, Apple and The Gap announced a promotion to award iTunes music downloads to Gap customers who tried on a pair of Gap jeans. From August 8 to 31, 2005, each customer who tried on any pair of Gap jeans could receive a free download for a song of their choice from iTunes Music Store. On February 7, 2006, Apple announced that they were counting down to the billionth song download and began a promotion similar to the previous 100 million and 500 million countdown. Whoever downloaded the billionth song would receive a 20" iMac, ten 60 GB iPods, and a US$10,000 iTunes Music Card. The billionth song was purchased on February 23, 2006 by Alex Ostrovsky of West Bloomfield, Michigan. The purchased song was "Speed of Sound" as part of Coldplay's X&Y album. On July 25, 2006, Facebook and iTunes began offering a promotion where members of the Apple Students group would receive a free 25 song sampler each week until September 30 in various music genres. The idea behind the promotion was to get students more familiar and enthusiastic with each service as Autumn classes approached. However, in order to prevent abuse of the promotion, the weekly code that Facebook provided stopped working after it was redeemed one million times. In addition, the promotion caused discontent among international students, as the code was only valid in the US iTunes Music Store. On April 10, 2009, Apple announced that it will be counting down to the billionth app. Apps being the applications for iPod Touch and iPhone. Launching a counter that is constantly running on Good Friday, Apple starting counting down. Connor Mulcahey, age 13 of Weston, CT, downloaded the billionth app, "Bump" by Bump Technologies, and received a 17" Macbook Pro, a 32GB iPod Touch, a Time Capsule, and a $10,000 Gift Card for iTunes Store. On February 11, 2010, Apple announced that it would be counting down to 10 billion songs downloaded. A $10,000 gift card was offered as a prize. On February 24, 2010, the 10 billionth song, "Guess Things Happen That Way" by Johnny Cash, was purchased by Louie Sulcer of Woodstock, Georgia. Currently, iTunes is supported on the macOS (Leopard and above) and Microsoft Windows operating systems. iTunes was known to run passably well in Linux on x86-based computers using the Wine compatibility layer; however, by December 2011, this was no longer the case. Users without iTunes installed can see a content database (but not hear or view the content itself) using the iTunes Preview service, which runs inside their internet browser. This service also allows users to watch trailers for upcoming film releases. Should they choose to purchase any media, they will be redirected to iTunes. Store pages are delivered using standard HTML with a special header. This change was made when iTunes 9.0 was released. iTunes uses WebKit to render these pages on the screen. These pages are also accessible on the Web, at itunes.apple.com, allowing pages from iTunes Store to show up in search engine search results. Prior to iTunes 9.0, iTunes Store was delivered using a custom XML format that describes the position of all of the elements, boxes, album art and all of their properties – including whether a reference link can be dragged out of iTunes and into another document. The store's back-end software uses WebObjects – Apple's own application server it acquired from NeXT. Content is uploaded to iTunes data store using an internal Apple program called iTunes Producer, which automatically encodes and adds metadata to uploaded files. For three years, The Beatles' record company Apple Records were in a legal dispute, Apple Corps v Apple Computer, with Apple Computer over the name "Apple." On May 8, 2006, a ruling was declared in favor of Apple Computer, but Apple Records said it would appeal the ruling. Despite this, plans were announced by Neil Aspinall in April 2006 to remaster completely and release the entire Beatles catalog on an unspecified online music service, as well as release some previously unheard work by the band. No date was set at that time. It has also been reported that the Beatles' music catalog might initially be appearing on iTunes only, as Apple is reported to be negotiating with Britain's EMI group over an online distribution deal that might be exclusive for a limited time. During his January 9, 2007 Macworld Keynote address, Apple CEO Steve Jobs used the band's song "Lovely Rita" to introduce the music-playing capabilities of the company's new iPhone. This was regarded by industry observers as further evidence that the Beatles catalog would be introduced to iTunes Music Store catalog in the near future. On February 5, 2007, Apple Corps and Apple Inc. announced they had reached a settlement in their legal dispute. In a related development, Apple announced on August 14, 2007 that the entire solo catalog of John Lennon would be available on iTunes. The solo catalogs of the other three Beatles, Paul McCartney, Ringo Starr, and George Harrison, are also available on iTunes. On November 16, 2010, the entire Beatles catalog was officially made available on iTunes Store. On June 6, 2006, The Consumer Ombudsmen in Norway, Sweden and Denmark launched a common open letter to Apple regarding the EULA of iTunes through the Norwegian Consumer Ombudsman Bjørn Erik Thon. The iTunes case is based upon an official complaint filed by The Consumer Council of Norway on January 25, 2006. The EULA is unbalanced to disfavor the customer. Scandinavian law requires any written agreement to favor both parties. The weak party also enjoys protection from exploitation according to Norwegian consumer laws. iTunes Store's use of Digital rights management limits the number of devices purchased songs can be played on. iTunes' contract entitles the company to at any time change the terms of the contract without notice, including the selection of players or software that must be used for iTunes files, and also the number of times a customer can change or copy already purchased files. The EULA is both vague and hard to understand for the customers. The EULA states that the legal relationship between the company and customers is regulated by English contract law. It is unreasonable to expect Norwegian consumers to have comprehensive knowledge of English law. Products marketed to Norwegian consumers in Norway are subject to Norwegian law—a right that cannot be waived by a clause in a company's standard customer contract. The EULA removes iTunes' responsibility regarding damage to the consumer's computer caused by software errors even though responsibility cannot be waived in Scandinavian Law. Apple responded July 31, 2006. Interoperability: the consumer should have the right and ability to play his or her music on any device of his or her own choice. Change of conditions: iTunes must revoke their right to change the terms and conditions (EULA) at any time without the consent of the consumer. Liability: iTunes should change its clause limiting its liability to recover consumer damages if they are caused by content sold by iTunes. Applicable Law: Consumers entering into a contract with iTunes should be able to rely on the consumer protection rules according to the law of the country in which they live. In 2004, Which? magazine complained to the European Commission about the higher prices in the UK for the same songs sold in other parts of the European Union: typically €0.99 in the rest of the EU and £0.79 in the UK. In 2008, the Commission withdrew its investigation after Apple agreed to end the price disparity. On July 1, 2007, the New York Times reported that Universal (the world's largest music corporation at the time of writing) would not renew its annual contract to sell music through iTunes. Instead, Universal said that it would market music to Apple at will, allowing it to remove its songs from the iTunes service on short notice if the two sides did not agree on pricing or other terms. On August 9, 2007, UMG announced a plan to sell some songs in MP3 format, without Digital rights management, through a variety of online services such as Amazon Music and the newly created gBox. While these tracks continue to be available through iTunes Store, Universal chose to license these songs in DRM-free formats only through other services. On August 31, 2007, Apple announced that programs on NBC's 2007–08 television schedule would not be available on iTunes. NBC had informed Apple the previous day that it would not be renewing its contract. It was later clarified that this change only applied to series produced by NBC Universal-owned Universal Media Studios, including Universal-produced shows on other networks such as House. NBC programs produced by other studios, such as Chuck (Warner Bros.) and Journeyman (20th Century Fox), would remain available on iTunes. Apple has publicly asserted that NBC would only renew their contract if Apple agreed to a price increase of US$4.99 per episode, which they did not. NBC disputes that claim, claiming that Apple balked at NBC's request to package shows together and make wholesale pricing more flexible. NBC claims that they never asked to double the wholesale price and insisted that their shows would be sold by iTunes Store through early December. Other networks who sell their shows via iTunes did not follow suit. On December 1, 2007, NBC shows were pulled from iTunes Store. On September 9, 2008, Apple and NBC Universal announced that NBC's TV shows were once again available on the US iTunes Store. The UK iTunes Store has many shows from NBC available, although they are distributed by Universal Studios. The pricing for these seasons are higher than they were on the US store, an example being, Season 3 of The Office is priced at UK£43.47 (roughly US$72) vs. $52.99 (US Store HD). ^ a b "Apple Unveils New iTunes". Apple. September 12, 2012. Retrieved September 27, 2012. ^ Langer, Andy (September 10, 2014). "Is Steve Jobs the God of Music?". Esquire. Hearst Communications. Retrieved July 10, 2017. ^ "The algebra of iTunes". CNN. June 15, 2013. Archived from the original on June 21, 2013. Retrieved June 17, 2013. ^ "iPhone 5 announcement: 3 important things to watch". NineMSN.com.au. September 12, 2012. Archived from the original on September 14, 2012. ^ a b Apple Inc. (March 5, 2012). "Apple's App Store Downloads Top 25 Billion". Retrieved May 10, 2012. ^ Knopper, Steve (April 26, 2013). "iTunes' 10th Anniversary: How Steve Jobs Turned the Industry Upside Down". Rolling Stone. Wenner Media. Retrieved July 10, 2017. ^ England, Lucy (May 8, 2015). "Apple has a playbook for killing free music, and it was written by Steve Jobs". Business Insider. Axel Springer SE. Retrieved July 10, 2017. ^ Locke, Laura (December 7, 2011). "Steve Jobs on the iTunes Music Store: The Unpublished Interview". Technologizer. Retrieved July 10, 2017. ^ Hill, Brad (April 29, 2013). "The iTunes influence, part one: How Apple changed the face of the music marketplace". Engadget. AOL. Retrieved July 10, 2017. ^ Chen, Brian X. (April 28, 2010). "April 28, 2003: Apple opens iTunes Store". Wired. Condé Nast. Retrieved July 10, 2017. ^ McElhearn, Kirk (January 9, 2016). "15 years of iTunes: A look at Apple's media app and its influence on an industry". Macworld. International Data Group. Retrieved July 10, 2017. ^ Dormehl, Luke (April 28, 2016). "Apple introduced iTunes Store 13 years ago today". Cult of Mac. Retrieved July 10, 2017. 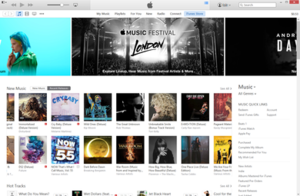 ^ "Apple Launches the iTunes Music Store". Apple Newsroom. Apple Inc. April 28, 2003. Retrieved July 10, 2017. ^ "Apple Launches iTunes for Windows". Apple Newsroom. Apple Inc. October 16, 2003. Retrieved July 11, 2017. ^ a b "iTunes Store Top Music Retailer in the USA". Apple Inc. April 3, 2008. Archived from the original on November 23, 2008. ^ "Apple's iTunes serves up 10-billionth song download". Apple. February 2010. Archived from the original on May 21, 2011. Retrieved June 17, 2013. ^ Daniel Eran Dilger (April 21, 2011). "iTunes Store quietly generates record revenues of $1.4 billion". Apple Insider. AppleInsider. Retrieved April 18, 2013. ^ a b "Apple's iTunes Store passes 35 billion songs sold milestone, iTunes Radio now has 40 million listeners – MacDailyNews - Welcome Home". Retrieved December 30, 2016. ^ "Apple's ITunes Overtaken by Streaming Music Services in Sales". Bloomberg.com. Retrieved July 24, 2018. ^ "The music business is growing again — really growing — and it's because of streaming". Recode. Retrieved July 24, 2018. ^ Warren, Tom (April 26, 2018). "iTunes is now available in the Microsoft Store for Windows 10". The Verge. Retrieved January 30, 2019. ^ Business, Heather Kelly, CNN. "Apple brings iTunes to Samsung TVs as it seeks new revenue". CNN. Retrieved January 30, 2019. ^ iOS Developer Program Website, Retrieved October 22, 2017 Apple Inc.
^ "Macworld: New iPhone Software, iTunes Video Rentals, Updated AppleTV". About.com. Retrieved April 28, 2009. ^ "AppleInsider, Apple Announces same day as DVD release iTunes movies sales". AppleInsider. Retrieved June 12, 2009. ^ "Free iTunes Music". Free iTunes Music. Retrieved September 19, 2013. ^ "Free iTunes 2013 – MacRumors Forums". MacRumors. Retrieved December 31, 2012. ^ "It Seems Apple Has Ended Its 'Single of the Week' Promotion After 11 Years". Business Insider. Retrieved January 13, 2015. ^ "List of Countries Where Apple Music and Beats 1 Radio Are Now Available". MacRumors.com. Retrieved July 7, 2017. ^ "Apple Music FAQ: The ins and outs of Apple's new streaming music service". MacWorld.com. Retrieved July 7, 2017. ^ "Take Apple Music for a spin". Apple.com. Retrieved July 7, 2017. ^ "iPod touch Features". apple.com. Retrieved September 25, 2007. ^ "Apple Ditches iTunes DRM, Adds Variable Prices, 3G Downloads". About.com. Archived from the original on December 2, 2009. Retrieved April 28, 2009. ^ "You Can Now Download iOS Apps Up to 50MB Over 3G (or 4G)". Gizmodo. March 7, 2012. Retrieved June 12, 2012. ^ "Apple ups limit of App Store downloads over cellular to 100MB". appleinsider.com. September 18, 2013. ^ Kazmucha, Allyson. "Daily Tip: how to contact iTunes support with billing and account questions". Mobile Nations. Retrieved July 8, 2013. ^ "iTunes Store Support: Customer Service". Apple Inc. Retrieved February 17, 2006. ^ a b Kelly, Meghan (November 1, 2012). "Support Sandy victims by donating through iTunes and eBay". VentureBeat. Retrieved November 1, 2012. ^ "iDonate: iTunes and the Haiti Earthquake". Current. January 15, 2010. Archived from the original on January 16, 2013. Retrieved November 1, 2012. ^ Olivarez-Giles, Nathan (March 13, 2011). "Apple iTunes accepting Red Cross donations for Japan quake and tsunami relief". Los Angeles Times. Retrieved November 1, 2012. ^ "Apple – iTunes". Apple Inc. Retrieved September 13, 2017. ^ Allan Ripp (June 17, 2015). "The iTunes Download Model Is Broken—Here's How to Fix It". The New York Observer. Observer Media. Retrieved April 1, 2016. ^ Rosoff, Matt (September 9, 2009). "New iTunes LP format is live". CNET. Retrieved September 19, 2013. ^ David Chartier (November 1, 2006). "Apple Announces iTunes Latino, Telemundo and mun2 in iTunes Store". Engadget. AOL. Retrieved March 30, 2016. ^ "Mastered for iTunes: Music as the Artist and Sound Engineer Intended" (PDF). Apple. Retrieved June 27, 2018. ^ "Hybrid Studios Mastering - Online Mastering Services - Free Sample of Services". Hybrid Studios. Retrieved June 27, 2018. ^ "Apple to end music restrictions". BBC News. January 7, 2010. Retrieved January 5, 2010. ^ "iTunes Store now infected with variable pricing, Amazon still $0.99". Engadget. April 7, 2009. Retrieved January 25, 2010. ^ The songs that are too rude for iTunes, Michael Cragg, The Guardian October 27, 2008 . Retrieved October 27, 2008. ^ iTunes glitch censors song titles. BBC. October 24, 2008. Retrieved June 17, 2013. ^ "Looking Back at the History of Apple's iTunes Store". Lifewire. Retrieved January 2, 2017. ^ a b Kai, Jakobs (July 31, 2014). Modern Trends Surrounding Information Technology Standards and Standardization within Organizations. IGI Global. ISBN 9781466663336. ^ "Apple's Online Music Store Makes Strong Debut". The Wall Street Journal. Dow Jones & Company. May 5, 2003. Retrieved March 28, 2016. ^ "iTunes Music Store Downloads Top 25 Million Songs". Apple – Press Info. Apple Inc. December 15, 2003. Retrieved March 28, 2016. ^ "iTunes Music Store Downloads Top 50 Million Songs". Apple Inc. March 15, 2004. Archived from the original on February 18, 2006. Retrieved February 17, 2006. ^ Markoff, John (April 29, 2004). "Apple Sells 70 Million Songs in First Year of ITunes Service". The New York Times. Archived from the original on July 22, 2009. Retrieved February 17, 2006. ^ "iTunes Music Store Catalog Tops One Million Songs". Apple Inc. August 10, 2004. Archived from the original on February 9, 2006. Retrieved February 17, 2006. ^ Farrell, Nick (October 6, 2011). "ITunes threatens music industry more than piracy". TechEYE.net. Archived from the original on October 16, 2011. Retrieved October 18, 2011. The CEO of Miramax [Mike Lang] has warned that iTunes is more of a threat to Big Content than piracy. [...] He said the chokepoints in the distribution chain were when there isn't enough diversity in distribution, so there are intermediaries that end up totally controlling an industry. He added that another problem is the emergence of digital monopolies such as the one Apple has in the digital music business. [...] The music business is suffering because it allowed too few players to flog content, presumably fearful of their content being stolen. Encouraging Apple's iTunes at the expense of others is effectively strangling the industry, he said. ^ a b Levy, Steven (2006). The Perfect Thing: How the iPod Shuffles. New York, NY: Simon & Schuster. ^ "Apple Launches iTunes Affiliate Program". Apple Inc. September 1, 2004. Archived from the original on February 12, 2006. Retrieved February 17, 2006. ^ "iTunes Music Store Downloads Top 150 Million Songs". Apple Inc. October 14, 2004. Archived from the original on February 13, 2006. Retrieved February 17, 2006. ^ "iTunes Music Store Downloads Top 200 Million Songs". Apple Inc. December 16, 2004. Archived from the original on February 6, 2006. Retrieved February 17, 2006. ^ "iTunes Music Store Downloads Top a Quarter Billion Songs". Apple Inc. January 24, 2005. Archived from the original on February 12, 2006. Retrieved February 17, 2006. ^ "iTunes Music Store Downloads Surpass 300 Million". Apple Inc. Archived from the original on February 15, 2006. Retrieved February 17, 2006. ^ "iTunes Music Store Launches in Denmark, Norway, Sweden & Switzerland". Apple Inc. May 10, 2005. Archived from the original on February 7, 2006. Retrieved February 17, 2006. ^ "Apple Kicks Off iTunes Music Store Countdown to Half a Billion Songs". Apple Inc. July 5, 2005. Archived from the original on February 17, 2006. Retrieved February 17, 2006. ^ "iTunes Music Store Downloads Top Half a Billion Songs". Apple Inc. July 18, 2005. Archived from the original on February 2, 2006. Retrieved February 17, 2006. ^ a b "Macworld '06: An overview of Apple's big day". Computerworld. Archived from the original on February 19, 2006. Retrieved February 17, 2006. ^ a b "iTunes Music Store Downloads Top One Billion Songs". Apple Inc. February 23, 2006. Archived from the original on July 24, 2008. Retrieved February 23, 2006. ^ a b c d e f "iTunes Store Tops Two Billion Songs". Apple Inc. January 9, 2007. Archived from the original on January 12, 2007. Retrieved January 11, 2007. ^ "100 Million iPods Sold". Apple Inc. April 9, 2007. Archived from the original on April 16, 2007. Retrieved April 9, 2007. ^ "iTunes Store Tops Three Billion Songs". Apple Inc. July 31, 2007. Archived from the original on August 25, 2007. Retrieved July 31, 2007. ^ "iTunes Store Tops Over Five Billion Songs Sold". Apple. June 19, 2008. Retrieved September 19, 2013. 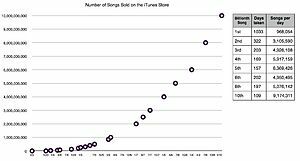 ^ "iTunes Sells 6 Billion Songs, And Other Fun Stats From The Philnote". TechCrunch. January 6, 2009. Retrieved January 6, 2009. ^ "iTunes Store Tops 10 Billion Songs Sold". Apple. February 25, 2010. Retrieved September 19, 2013. ^ "10 Billionth Song Sold by Apple's iTunes". ABC News. February 25, 2010. Archived from the original on March 1, 2010. Retrieved September 19, 2013. ^ "Apple has now sold 15 billion iTunes songs". Digital Music News. June 6, 2011. Retrieved April 14, 2012. ^ "Apple Special Event". Apple Inc. September 12, 2012. Retrieved February 6, 2013. ^ "iTunes Store Sets New Record with 25 Billion Songs Sold". Apple Inc. February 6, 2013. Retrieved February 6, 2013. ^ "iTunes Music Store Sells One Million Videos in Less Than 20 Days". Apple Inc. October 31, 2005. Archived from the original on February 19, 2006. Retrieved February 17, 2006. ^ "NBC Universal & Apple Offer New Primetime, Cable, Late-Night & Classic TV Shows on the iTunes Music Store". Apple Inc. December 6, 2005. Archived from the original on February 17, 2006. Retrieved February 17, 2006. ^ a b "Award-Winning MGM Films Now on the iTunes Store". Apple Inc. Archived from the original on April 16, 2007. Retrieved April 12, 2007. ^ a b "ABC, CBS, FOX & NBC Offer Incredible Lineup of Programming in Stunning HD on the iTunes Store". Apple Inc. Archived from the original on October 17, 2008. Retrieved October 16, 2008. ^ "iPhone App Store Downloads Top 10 Million in First Weekend". Apple Inc. July 14, 2008. Archived from the original on June 25, 2009. Retrieved June 20, 2009. ^ "App Store Downloads Top 100 Million Worldwide". Apple Inc. September 9, 2008. Archived from the original on December 15, 2008. Retrieved December 7, 2008. ^ "iPhone App Store continues to exceed iTunes song sales growth". AppleInsider. October 22, 2008. Retrieved December 7, 2008. ^ "App Store: 25 000 apps, 800 million downloads". VentureBeat. March 17, 2009. Retrieved March 25, 2009. ^ a b "iTunes – Thanks a Billion". Apple. Archived from the original on April 27, 2009. Retrieved September 19, 2013. ^ "Apple's App Store Downloads Top 1.5 Billion in First Year". Apple Inc. July 14, 2009. Archived from the original on August 22, 2009. Retrieved August 28, 2009. ^ "Apple App Store hits more than 10 billion Apps downloads". Archived from the original on January 25, 2011. ^ "Apple's App Store Downloads Top 15 Billion". ^ CNET (June 11, 2012). "Apple: 30B apps downloaded, 400M App Store accounts set up". Retrieved February 6, 2013. ^ 9to5Mac (October 23, 2012). "Apple by the numbers". Retrieved February 6, 2013. ^ Apple Inc. (January 7, 2013). "App Store Tops 40 Billion Downloads with Almost Half in 2012". Retrieved February 6, 2013. ^ Perez, Sarah (June 2, 2014). "iTunes App Store Now Has 1.2 Million Apps, Has Seen 75 Billion Downloads To Date". TechCrunch. Retrieved June 10, 2015. ^ Ingraham, Nathan (June 9, 2015). "Apple's App Store has passed 100 billion app downloads". The Verge. Retrieved June 10, 2015. ^ "App Download and Usage Statistics - Business of Apps". ^ "iTunes Dominates Download Market & Streaming Audio Grows". CEPro.com. October 10, 2012. Retrieved October 16, 2012. ^ "iTunes, App Store, iBooks, and Mac App Store Affiliate Resources – Available Countries and Regions". Retrieved October 27, 2013. ^ a b c d e f g h "iTunes Store: Which types of items can I buy in my country?". Apple. Retrieved September 19, 2013. ^ a b "iTunes in the Cloud, iTunes Match, & iTunes Radio Availability". Apple. Retrieved September 19, 2013. ^ "Apple will start charging for iTunes Radio on January 28th" . TheVerge.com. January 15, 2016. Retrieved July 7, 2017. ^ a b c d e f g h i j k l m n o Slivka, Eric (December 16, 2011). "Apple Temporarily Halts New iTunes Match Subscriptions in New International Markets". MacRumors. Retrieved September 19, 2013. ^ a b c d e f g h i j k l m n o p q r s t u v w x y z aa ab ac ad ae af ag ah "Average for USD in multiple currencies for Jan 2010 to Dec 2010". Retrieved January 3, 2011. ^ a b c d e f Heath, Alex (April 30, 2012). "iTunes Match Rolling Out To More Countries, Now Available in Italy, Greece, Portugal, Austria". Cult of Mac. Retrieved September 19, 2013. ^ "(from Dutch) Breaking Movies have appeared in the Dutch iTunes Store". September 27, 2011. ^ a b c d e f g h i j k l m n o p q r s Slivka, Eric (January 16, 2012). "iTunes Match Launches in 19 New Countries: Latin America, Baltics, Netherlands". MacRumors. Retrieved September 19, 2013. ^ a b "Apple Launches iTunes Music Store in Japan". Apple Inc. August 4, 2005. Archived from the original on February 10, 2006. Retrieved February 17, 2006. ^ "Apple – Press Info – Apple Launches iBookstore in Japan". Apple Inc. March 6, 2013. Retrieved March 6, 2013. ^ "Award-Winning Television Programming Now Available on the iTunes Store in Australia". Apple Inc. June 25, 2008. Archived from the original on November 3, 2008. Retrieved June 26, 2008. ^ "Apple makes Australia the second country to get iTunes Radio". The Australian. February 11, 2014. Retrieved February 11, 2014. ^ "Apple Launches iTunes & Online Apple Stores in New Zealand". Apple Inc. December 6, 2006. Archived from the original on December 7, 2006. Retrieved December 6, 2006. ^ "iTunes México – Movies". iTunes. Retrieved September 19, 2013. ^ a b c d e f g h i j k l "iTunes store now available in Malta". The Times (Malta). September 29, 2011. Retrieved October 11, 2011. ^ a b Slivka, Eric (July 19, 2012). "iTunes Match Goes Live in Hungary and Poland". MacRumors. Retrieved September 19, 2013. ^ a b c d e f g h i j k l m n o p q r s t u v w x y z aa ab ac ad ae af "Apple confirms iTunes Store launch in 15 Latin American countries and iTunes Match in Brazil". TNW. Retrieved February 20, 2017. ^ a b c d e f g h i j k l m n o p q r s t u v w x y z aa ab ac ad ae af ag ah ai aj "Apple launches iTunes Store in 12 new Asian markets". Channel NewsAsia. Retrieved June 27, 2012. ^ a b c d e f g h i j k l m n o Slivka, Eric (June 21, 2012). "App Store Launches in 32 New Countries". MacRumors. Retrieved September 19, 2013. ^ a b c d e f g h i j k l m n o p q r s t u v w x y z aa ab ac ad ae af ag ah ai aj ak al am an ao ap Slivka, Eric (December 12, 2012). "iTunes Store Movie Content Goes Live in 42 New Countries". MacRumors. Retrieved September 19, 2013. ^ "Один шаг до iPhone в России?" (in Russian) Archived May 3, 2015, at the Wayback Machine. CNews.ru. April 6, 2008. Retrieved October 22, 2012. ^ "Apple Music launches in China, so don't forget to cancel trial membership". ComputerWorld. Retrieved September 30, 2015. ^ "iTunes Music Store in Europe Sells 800,000 Songs in First Week". Apple Inc. June 23, 2004. Archived from the original on August 28, 2006. Retrieved February 17, 2006. ^ "Japan iTunes Music Store Sells One Million Songs in First Four Days". Apple Inc. July 8, 2005. Archived from the original on February 9, 2006. Retrieved February 17, 2006. ^ "Apple inadvertently lights up New Zealand iTMS". Infinite Loop. Ars Technica. October 26, 2005. Retrieved February 17, 2006. ^ "Apple Announces iTunes Latino on the iTunes Store". Apple Inc. November 1, 2006. Archived from the original on January 14, 2007. Retrieved November 1, 2006. ^ "iTunes Music Store llegará en agosto a México" (in Spanish). El Universal. June 30, 2009. Retrieved September 19, 2013. ^ Venkataramu, Ramya. "Analysis and enhancement of Apple's FairPlay digital rights management" (PDF). Department of Computer Science. San Jose State University. Archived from the original (PDF) on July 20, 2010. Retrieved July 7, 2017. ^ Dilger, Daniel Eran (February 26, 2007). "How FairPlay Works: Apple's iTunes DRM Dilemma". Roughly Drafted. Archived from the original on September 27, 2017. Retrieved July 7, 2017. ^ Slivka, Eric (March 22, 2011). "Steve Jobs Required to Provide Deposition in 2005 iTunes Antitrust Case". MacRumors. Retrieved July 7, 2017. ^ Yuhas, Alan (December 16, 2014). "Antitrust lawsuit against Apple: 10 years in the making, shot down in three hours". The Guardian. Guardian Media Group. Retrieved July 8, 2017. ^ "How Fairplay Works on Apple iTunes Content, like iTunes Movies/TV Shows, Music and eBook?". 9to5Mac. June 19, 2014. Retrieved July 8, 2017. ^ Hamilton, Dave (September 2, 2015). "How iTunes Movie DRM-Removal Software Keeps Me Honest". The Mac Observer. Retrieved July 8, 2017. ^ Tanous, Jim (September 2, 2015). "The iTunes DRM Removal Saga: NoteBurner and a Look Back at Requiem". TekRevue. Retrieved July 8, 2017. ^ "Thoughts on Music". Apple Inc. February 6, 2007. Archived from the original on February 7, 2007. Retrieved June 23, 2017. ^ Kim, Arnold (February 6, 2007). "Steve Jobs 'Thoughts on Music' - Asks for No Digital Rights Management". MacRumors. Retrieved June 23, 2017. ^ Hesseldahl, Arik (February 7, 2007). "Steve Jobs' Music Manifesto". Bloomberg. Retrieved July 8, 2017. ^ Markoff, John (February 7, 2007). "Jobs Calls for End to Music Copy Protection". The New York Times. Retrieved July 8, 2017. ^ Arrington, Michael (April 2, 2007). "EMI, Apple To Sell DRM-Free Music for $1.29/song". TechCrunch. AOL. Retrieved June 23, 2017. ^ Johnson, Bobbie (January 6, 2009). "Apple drops DRM copy protection from millions of iTunes songs". The Guardian. Guardian Media Group. Retrieved July 8, 2017. ^ McLean, Prince (January 6, 2009). "iTunes Store goes DRM Free, offers over-the-air downloads". AppleInsider. Retrieved July 8, 2017. ^ Cohen, Peter (January 6, 2009). "iTunes Store goes DRM-free". Macworld. International Data Group. Retrieved July 8, 2017. ^ Caldwell, Serenity; Keller, Joseph (July 18, 2016). "Apple Music will now let you store your music library DRM-free". iMore. Retrieved July 8, 2017. ^ Charles Arthur (June 22, 2006). "Who benefits from the death of mycokemusic.com?". Guardian Unlimited. London. Retrieved February 19, 2007. ^ "Jeans and Music – The Perfect Fit at Gap this Fall". Gap Inc. July 28, 2005. Archived from the original on July 30, 2005. Retrieved February 17, 2007. ^ Cheng, Jacqui (July 25, 2006). "Infinite Loop: Apple and Facebook partner up for back to school iTunes promo". Ars Technica. ^ "Help iTunes reach 10 billion song downloads, and you could win a $10,000 iTunes Gift Card". Retrieved February 11, 2010. ^ "Wine Application DB – Viewing App – iTunes". winehq.org. Archived from the original on September 10, 2004. Retrieved May 1, 2006. ^ "iTunes 9, now with more WebKit". Will Norris. Retrieved September 12, 2009. ^ "Beatles Catalog To Be Remastered, Offered Online". World Entertainment News Network. Starpulse. November 11, 2006. Archived from the original on November 12, 2006. Retrieved December 17, 2006. ^ Arungo, Tim (November 27, 2006). "Beatles: only on iPod?". Fortune. Retrieved December 17, 2006. ^ "Apple teases fans with "Lovely Rita" — but no Beatles on iTunes". International Herald Tribune. Retrieved December 12, 2012. ^ "Apple Inc. and The Beatles' Apple Corps Ltd. Enter into New Agreement" (Press release). Apple Inc. February 5, 2007. Archived from the original on February 7, 2007. Retrieved February 5, 2007. ^ "John Lennon Solo Catalog Debuts on iTunes Store" (Press release). Apple Inc. August 14, 2007. Archived from the original on August 21, 2007. Retrieved August 15, 2007. ^ "iTunes' questionable terms and conditions". Forbrukerportalen. January 25, 2006. Archived from the original on February 8, 2007. Retrieved September 19, 2013. ^ European consumer organisations join forces in legal dispute over iTunes Music Store. CNN. Retrieved on January 28, 2007. ^ a b "Apple cuts UK iTunes prices". The Register. January 9, 2008. Retrieved December 12, 2012. ^ "Universal in Dispute With Apple Over iTunes". The New York Times. July 2, 2007. Retrieved December 30, 2016. ^ Aughton, Simon (August 13, 2007). "gBox – Not Google – has DRM-free Universal deal". PC Pro. Archived from the original on October 11, 2007. Retrieved August 13, 2007. ^ "iTunes Store To Stop Selling NBC Television Shows". Apple Inc. August 31, 2007. Archived from the original on May 21, 2011. ^ Barnes, Brooks (August 31, 2007). "NBC Will Not Renew ITunes Contract". The New York Times. Retrieved September 3, 2007. ^ New Episodes of Fox's House Won't Be on iTunes, Broadcasting & Cable, October 1, 2007. ^ Fritz, Ben (August 31, 2007). "iTunes drops NBC's new fall shows". Variety. Retrieved September 3, 2007. ^ "NBCU's Response: Never Asked To Double Price; Shows Will Be On iTunes Through Early December". August 31, 2007. ^ Michelle Quinn (September 9, 2008). "Apple revamps the iPod Nano, promises iPhone fixes". Los Angeles Times. Retrieved March 30, 2016.